Throughout his career, Russell Kridel, MD, has made numerous significant contributions to his specialty of facial plastic surgery. For example, he has pioneered several Rhinoplasty and Revision Rhinoplasty surgical techniques that are considered the gold standard among peers and taught in medical schools throughout the U.S. and the world. His passion for advancing medical techniques and sharing that knowledge with other physicians, along with the ultimate goal of advancing the quality of patient care and surgical success, is once again revealed in his recent journal article, "A Staging System for Revision Rhinoplasty." Dr. Russell Kridel and Dr. Regina Rodman, recently introduced a new staging system, the PGS System, to determine the overall difficulty of surgery for revision rhinoplasty. Their findings have been released and published in the prestigious JAMA Facial Plastic Surgery Journal; "A Staging System for Revision Rhinoplasty." The 3 major components of the PGS system can be described as; the “P” represents “problem,” consisting of the specific anatomic anomaly with which the patient presents. The second component in our system is “G” for “graft,” based on the number of grafts required. The third component of this system is “S,” for “number of previous surgical procedures.” In addition, Kridel and Rodman have included a category “E,” for “patient expectations,” which is added after the stage of the patient’s condition has been determined through the PGS classification. As Dr. Kridel states in the journal article, a standardized evaluation system such as PGS System, will allow meaningful comparisons of surgical techniques and evaluations of outcomes of rhinoplasty procedures among physicians. In addition, the PGS preoperative staging system also help patients understand the degree of difficulty of their required repair and help manage expectations. 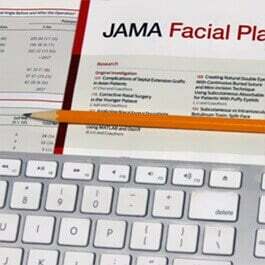 The journal article also contains a very informative audio interview (JAMA Facial Plastic Surgery podcast) with Russell Kridel, you won't want to miss about this exciting classification system. There has also been additional media attention given to Dr. Kridel's PGS system, noted here. Dr. Kridel has published more than 65 scientific journal articles and text book chapters on Rhinoplasty and Revision Rhinoplasty. Physicians seek out Dr Kridel for their own surgery, as well as refer friends and family because of his skill and expertise. It is no surprise that he is known throughout Houston and the country as "The Nose Doctor." To make an appointment with Houston Rhinoplasty specialist, Dr. Kridel for a consultation, please call 713/526-5665.